The Australian Maritime Safety Authority�s (AMSA) Rescue Coordination Centre (RCC Australia) can confirm that the rescue operation from the Akademik Shokalskiy in Antarctica has been completed. RCC Australia was notified at 6.15pm AEDT yesterday evening that the first group of 12 passengers had boarded the helicopter from the Xue Long at around 6pm AEDT. RCC Australia was then notified at 7.30pm AEST that the first 12 passengers had arrived at the Aurora Australis. Five flights were conducted to take the passengers to the Aurora Australis over a distance of about 14 nautical miles. Four flights were undertaken with 12 people each flight, and the fifth flight rescued four passengers. The helicopter landed on an ice floe adjacent to the Aurora Australis. At 10.05pm AEDT, AMSA was advised that all 52 passengers had been safely rescued and were on board the Aurora Australis. Aurora Australis advised AMSA that helicopter operations had been completed at about 10.45pm AEDT and all passengers, luggage and equipment had been transferred. The Aurora Australis will now start heading towards open water. The ship is currently traveling at a quarter knot in heavy ice towards open water. It will take until late evening to reach open water. 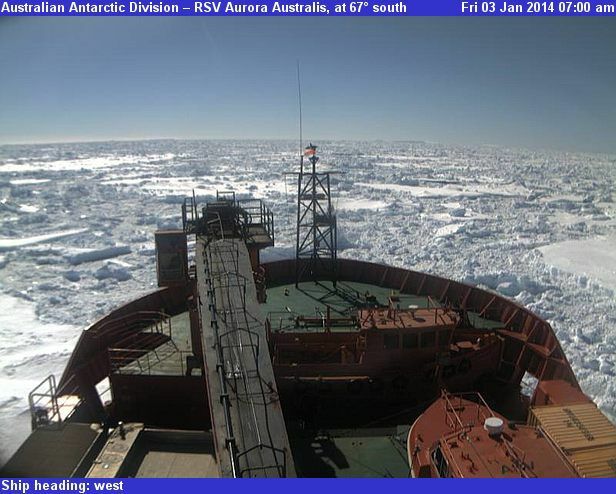 The Aurora Australis will then head towards the Casey base to complete a resupply before heading to Australia. The Aurora Australis is not expected to arrive in Australia until mid-January. All 22 crew members of the Akademik Shokalskiy remain with the vessel. 1.Who paid for this expedition? 2.How did the expedition team come to include Turney�s wife and two young children? 3.How serious was this scientific endeavor? 4.Was the choice of ship wise, given it is not an icebreaker? 5.How did the ship, in these days of satellite imaging, high quality weather forecasts and radar, come to get stuck in ice? 6.How much did the rescue cost? 7.Who pays for this rescue? 8.Why have the ABC and Fairfax media, so keen at first to announce this expedition was to measure the extent and effects of global warming, since omitted that fact from their reports after the expedition became ice-bound? 9.Why have all those reports � and the expedition leader himself � neglected to mention that sea ice around Antarctica has increased over the past three decades � and is greater than the ice cover Douglas Mawson found a century ago? 1.Who pays for the trip back to Australia once they get let off at Casey Station? 2.How much damage has this fiasco done to real science expeditions in Antarctica, not only from a delayed logistics standpoint, but also from PR standpoint? 3.Why did the stranded ship reach out for weather forecasts and data when they should have been equipped for this in the first place? 4.Who will be responsible if the ship ends up being stuck in ice permanently or gets its hull crushed and sinks? 5.What will be the duties and fate of the crew left behind? 6.Who funded the ARGO ATV�s after Turney�s Indiegogo crowdsourcing campaign failed miserably? Do those people get a refund? 7.Why would Turney book this ship when it has only the barest of ratings for sea ice? Some good questions which require some good (and honest) answers. This page contains a single entry by DaveH published on January 2, 2014 4:17 PM. Lecture cancelled was the previous entry in this blog. A night at the movies is the next entry in this blog.